Saturday morning, Ole Miss football honored senior defensive end Austrian Robinson as the winner of the Chucky Mullins Courage Award. 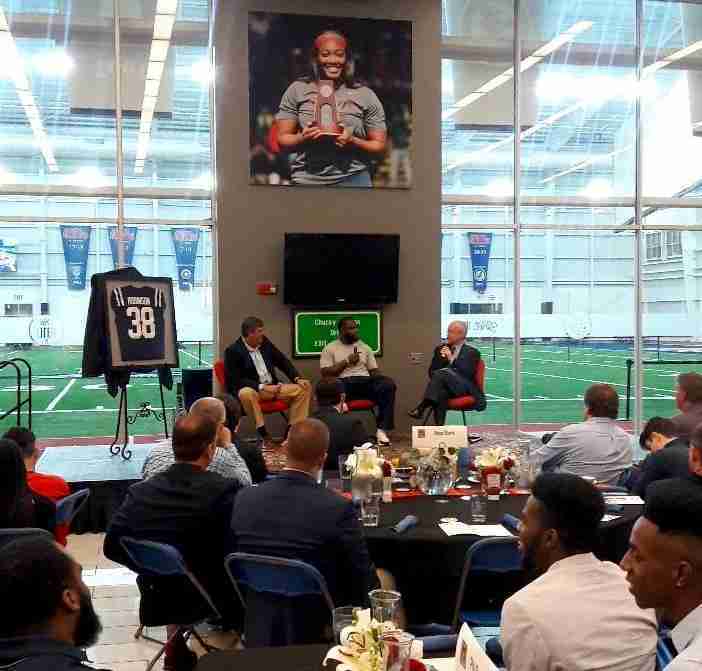 For the 30th consecutive year since his horrific injury on October 28, 1989, the late Roy Lee “Chucky” Mullins has been honored by Ole Miss football with the presentation of this year’s Chucky Mullins Courage Award to senior defensive end Austrian Robinson. Chucky was a hard-nosed nickelback who arrived on campus in the summer of 1988 under head coach Billy Brewer. Chucky quickly became a firecracker on the Rebels’ defense and made his name known around the SEC. However, on Homecoming Night, October 28, 1989, his life changed forever when Chucky shattered four vertebrae in his cervical spine as he laid a hit on Vanderbilt tight end Brad Gaines. Chucky was immediately paralyzed. His wonderful attitude and endearing charm made Chucky a huge public figure, and he inspired many across the football world and USA, alike. While in the hospital, Mullins received visits from the notables such as President George H. W. Bush, Janet Jackson, and Walter Payton, among many others. All who visited Chucky recognized a remarkable young man who displayed unwavering courage. However, on May 1, 1991, Chucky unexpectedly stopped breathing and was rushed to the hospital, where he never regained consciousness. 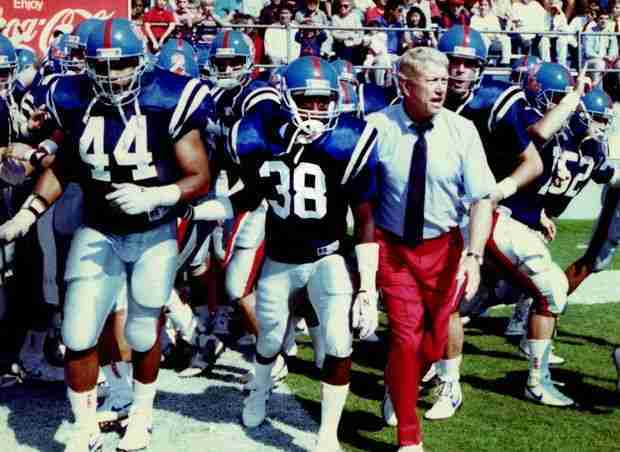 On May 6, 1991, Roy Lee “Chucky” Mullins passed away. Since 1990, the Chucky Mullins Courage Award has been given to a special Rebel defender. That player is given the opportunity to don Chucky’s retired No. 38 jersey for the coming season. It is considered the highest award that an Ole Miss player can receive, and it is easy to see why. Saturday morning, the annual ceremony was held in the Indoor Practice Facility where tribute was paid to Chucky. Coach Luke then introduced Austrian as this year’s winner. Robinson was selected from among several veteran defensive players by Coach Luke and the Rebel coaching staff. The award is presented annually to an Ole Miss upperclassman defensive player that embodies the spirit of Mullins – courage, leadership, perseverance and determination. In his three-year Ole Miss career, Robinson has appeared in 26 games on the Rebels’ defensive line. Robinson, who played in 11 games last season at both defensive tackle and defensive end, has 52 career tackles, including 5.5 tackles for loss. Former Chucky Mullins Courage Award recipients are: Chris Mitchell, Jeff Carter, Trea Southerland, Johnny Dixon, Alundis Brice, Michael Lowery, Derek Jones, Nate Wayne, Gary Thigpen, Ronnie Heard, Anthony Magee, Kevin Thomas, Lanier Goethie, Jamil Northcutt, Eric Oliver, Kelvin Robinson, Patrick Willis, Jeremy Garrett, Jamarca Sanford, Marcus Tillman, Kentrell Lockett, Deterrian Shackelford (twice), Jason Jones, Mike Marry, Mike Hilton, John Youngblood, Marquis Haynes and C.J. Moore.